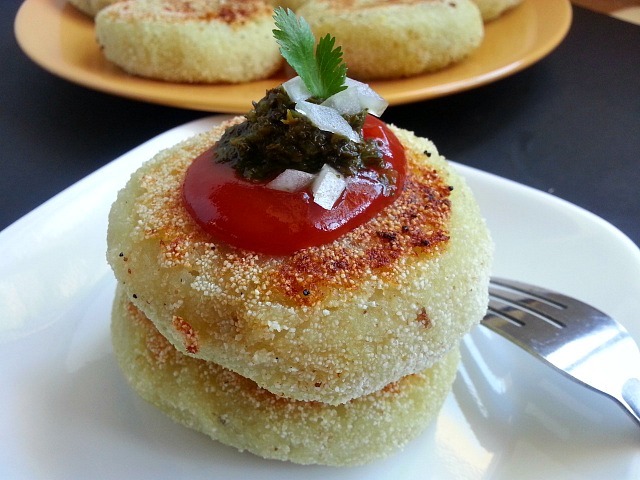 Goan Mince Meat Potato Chops is a soft delicate potato pattie stuffed with seasoned cooked beef. 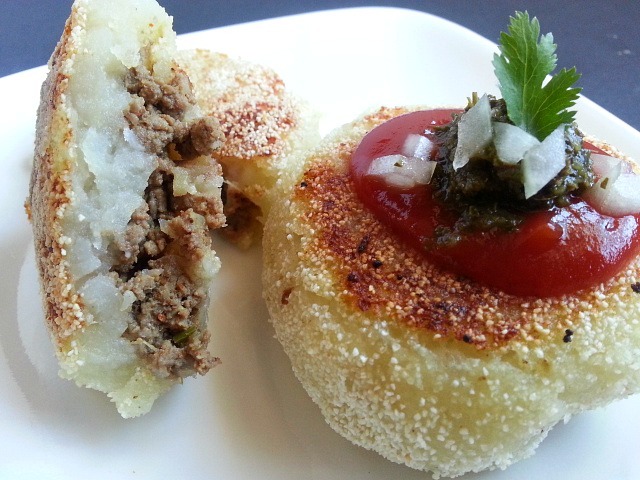 It is very similar to the Cuban Papas Rellenas with a couple of twists. 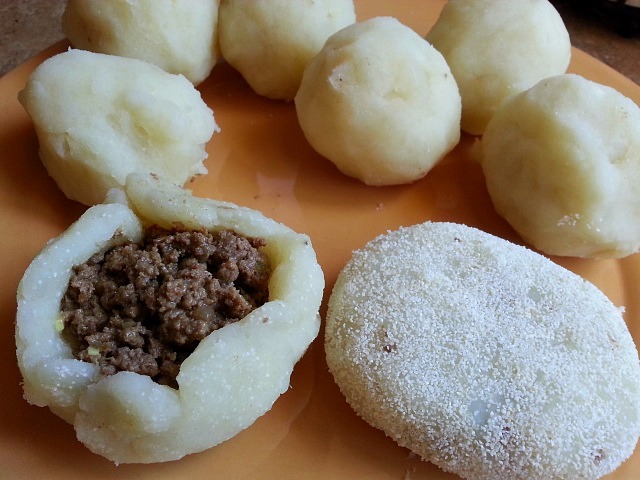 Goan’s cook the meat stuffing without peas and carrots, they use cream of wheat instead of bread crumbs as coating and shallow fry the disk shape pattie instead of deep-frying the potato balls. I know it seems quite far apart but when you take a bite it taste very close to the potato chops. There are many variations I have seen online. Some use a little flour mixed with the potato mash, an egg wash, bread crumb and corn starch. You can make it vegetarian by using cooked peas and carrots in garam masala with some onions and fresh cilantro/ coriander then mixed with the mashed potato and shallow fried. You can replace the beef with cooked ground chicken or turkey. At times my mom would use leftover beef roast. She would put small pieces through the meat grinder then saute it with some onions, green chili / jalapeno. Other times if meat was too less she would mix it with the potato mash. You want to skip tomato for this recipe as the meat needs to be dry to be stuffed. 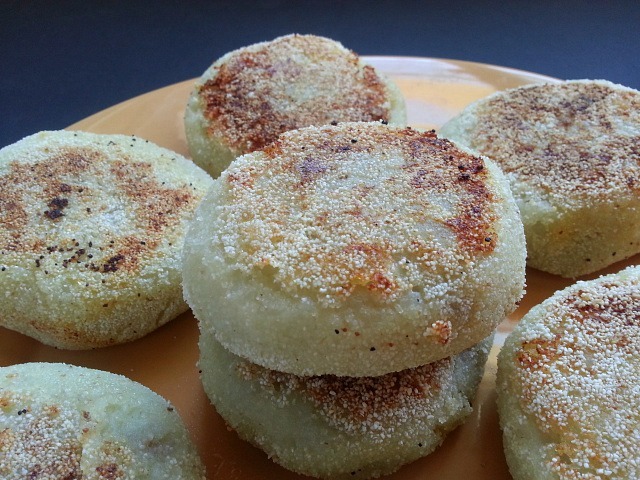 The Goan Potato Chops were usually made as a side dish. As eating out got popular in the 90’s they used to be served as appetizers in coffee shops with a side of ketchup. You can make them mini’s for your cocktails parties. Heat oil in a pot, saute the onions till translucent. Add ginger-garlic paste and saute. Add the xacuti masala, vinegar and saute for 1-2 minutes. Next add the ground beef and mix it well with all the spices add water and salt to taste and cook covered for 15-20 minutes on medium heat. Uncover and cook for another 5-10 minutes till all the water dries. Wash and boil the potatoes on medium heat till you can stick a knife through, about 20-25 minutes. Take it out of the pot and let cool. Take off the skin and mash the potatoes, season with a little salt. Divide in equal portions about the size of a golf ball. 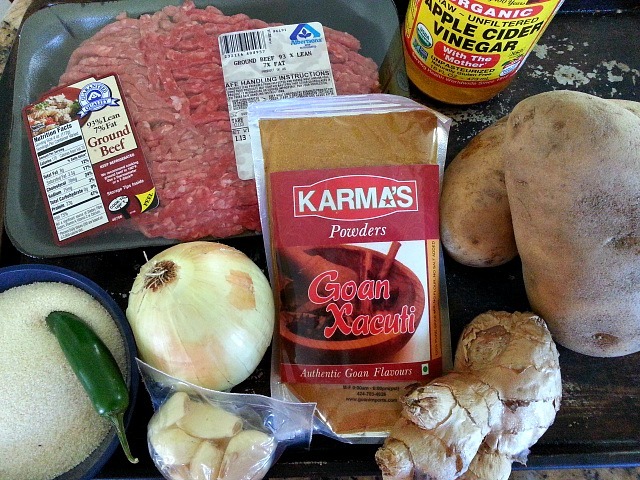 Flatten with your hand each ball and then stuff the center with cooked ground beef. Gather at the center the mashed potato to cover the meat and shape it into approx 1/2″ thick disk or hockey puck. Cover in cream of wheat and shallow fry each side for about 1.5 to 2 minutes on each side till it has a nice golden brown crust. Do you have a similar recipe with a different name. I would love to hear about it in the comment section of this post. This sounds fabulous. I will try for sure. thanks for the follow Nandini. Yummy! Your photos make me want to lick my monitor! That’s similar to what I’m making now!!! That you so much for the re-blog. Appreciate it very much. I love this idea, Nandini. The pictures are gorgeous, simply mouthwatering. Hugs. Hello Nandini! I have been meaning to thank you for your “likes” on my blogposts. I just checked out the Potato Chop post and it looks very interesting! Italians make something like this called Aranciata — a meat-and/or-mozzarella stuffed ball of rice that is then breaded and deep-fried. But I like the chile flavors in your recipe and hope to try it one of these days! Reading through your recipes this morning is making me very hungry. Yum. This looks delicious. And room to play a bit with spices. I would likely use finely ground cornmeal due to not using wheat as much as possible. So glad you stopped by my blog! Thank You so much. Ground cornmeal should work just as perfectly to get the crunch. I love this recipe. Looks simple. I’m going to make it. I bet it’s delicious. The only thing is I might not be able to get the exact spice. Hmmm. Thanks for liking my recipe for Ground Beef with Kale and Carrots, too. That looks so good! Can’t wait for it to start cooling off so I can begin to cook again. Do you cook the cream of wheat or just use the dry meal as a coating? Could you use cornmeal?